First and foremost, welcome! Welcome, welcome, welcome! Please, pull up a chair while I share with you all the many great features and tools on $5 Dinners.com! I’m so glad you are here! This morning, several recipes from my first cookbook were featured on the show. And yes…they each cost me less than $5! My cookbooks are the best resources for getting all the information about strategic couponing, strategic grocery shopping, strategic meal planning, batch cooking, homemade convenience foods and more. They are comprehensive and will give you the “big picture” that is the $5 Dinners concept…and will help you start spending less of your hard earned money at the grocery store!!! The $5 Dinner Mom’s One Dish Dinners – I am currently working on the manuscript for this cookbook, but you can find some recipes and tips over at OneDishDinners.com! If you use an RSS reader, such as Google Reader, you can get free RSS updates there as well. Each of the daily, express and weekly newsletters are completely free. Yes…completely free!!! And again, welcome! We are so glad you are here! We hope that the cookbooks and the website will help you spend less and less each week at the grocery store! Let’s cut that grocery bill in half, shall we?! I have been following your website for a little over a year. I just say your segment on The View and you did a fantastic, awesome job! The ladies seem so funny (Whoopi!) but you gave out great tips and information. Congrats! Just watched you on The View (which I never watch, only watched because you were on) and you were great!!! Congratulations! I have your first cookbook and love it. I have followed your blog since before your book came out. Love what you do and appreciate it! Thank you. Your meals looked delicious on The View! Love This! Thanks for sharing your tips! I’ve been praying for some Practical Help & I think your ideas are just the right receipt for me to be more efficiant & organized while providing ecconomical meals that don’t taste like they are! Looking forward to the couponing/cooking adventure of $5 Dinners! You did amazing Erin!!!!!! And you looked gorgeous! God Bless and here’s to your continued success. I appreciate you! Just saw u on The View for someone that thought she couldn’t talk earlier in the week u did a great job on talking a hundred miles a minute, guess u have to go fast if u only have a short amount of time. I have your latest cookbook but would like to have it signed how can I do this if I live in FL? I drank more tea and ate more potato chips in 4 days than I did for the past 2 years combined to get my voice back! Even got some steroids! It was still raspy, but it came back strong for me! I’ll email you about the book. Using your “food resources” has enabled us to lower our food bills, quite an accomplishment with 2 football playing teenagers and a very active older son. We may not be able to do it for five dollars, but are usually able to feed the 5 of us for under ten! Looking forward to your next book. Great segment on the view! I love the phrase ” Strategic Couponing”! Extreme couponing never made a lot of sense to me, because if you don’t donate or use it before it spoils, or is damaged – there is no savings! I have always been a “Strategic shopper” and also plan my menu’s according to the sales & seasonal cycles. I can usually save at least 50% off retail on my grocery bill each time I shop. Saving on a regular basis is easier, more practical and something anyone can do with little effort. With your books it’s a “no brainer” for those who were not fortunately born frugal. I do occasionally use a coupon along with store sales on a double coupon day, but my best strategy is purchasing enough of the big sale “loss leaders” (on the front of the store flier) to last until the next big sale and ignore the minor sale items until they reach the price I want to pay. I easily fed my family of 4 on @ $40 week (less when it’s harvest time in my container gardens on the apartment terrace!) So what if it isn’t 4 carts full at 98% savings. Who needs 15 lifetime supplies of deodorant anyway?!? I was off today and took advantage to watch you. 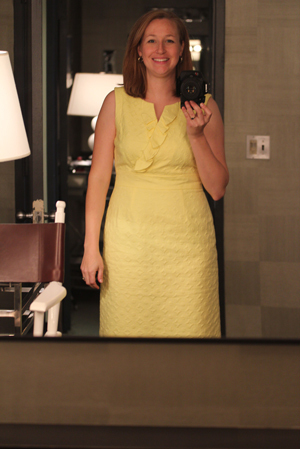 Loved the yellow dress! AWESOME! Congrats. I have been checking out your blog since before the book. I missed the episode but I am very happy for you. You deserve all of the success that you receive. Great tips! I just came here to print out my Monthly planner! Thank you! I have been a fan of your website for about a year, it has helped me save about half on my grocery bills and also eat healthier. I had to work yesterday, and didn’t catch your segment, will you be posting a link to it so that those of us that missed it can see it? Erin, I’ve followed your site for a few years now. I was so excited to turn on the View and hear that you would be on it. I wish they could have given you 2 segments!